I thank God for helping me find the picture for this section. Can you tell where this guy is sleeping? It’s a gym! What a great reminder that we need more than hard work to grow. Generally, we experience our need for physical rest after a hard day’s work in which we’ve given our all. So we look forward to even a temporary reprieve from the burdens of the day. So often, however, even the best physical rest isn’t enough. Have you ever started the day invigorated by a good night’s sleep, but your early morning energy was quickly overshadowed by depressing tasks and difficult people? Still, we must learn to chill out or we will burn out. But how? The answer comes in looking back for our spiritual rest. The early church seems to have changed the day of Sabbath rest from the last day of the week to the first (Acts 20:7 & 1 Corinthians 16:2) to be a regular reminder that Jesus’ work has already accomplished our peace. Let’s think about that. Jesus gives us lasting rest from the weights that we have tried to carry on our own. For example, His work on the cross covered all of our sins – past, present and future (Hebrews 4:1-11); He initiates and follows through with every part of believers’ lives (Romans 8:28-30 and Ephesians 2:1-10); and His love, wisdom, and power are the same for us yesterday, today and forever! (Hebrews 13:8 and Revelation 1:8) We can rest in Him when we understand and accept that He has established our worth, purpose and security in our stead! Augustine, one of the early church fathers, wisely said that “God has made us for Himself, and our hearts are restless until we find our rest in Him.” Think about that. His statement reminds us that our sense of physical exhaustion is often from spiritual fear. Think about the physical impacts on us when we worry. If I sit up in bed early in the morning and go into panic-mode that “I don’t have what it takes to make it today!” my energy begins to drain almost immediately. Moms, what is it like for you to crave a short nap while your kids are at school because you’ve been working so hard at home, but there’s just too much to do and no one seems to notice or care? Many of us grow even wearier because we seek spiritual rest by physical means – naps, music, food, etc. – and find that these do not satisfy. Consider one of my own battles. In February 2003, my unit’s convoy crossed into Iraq and drove for 72 hours before we got to our tactical assembly area. Since Chaplains are not allowed to carry weapons, I had been driving the entire time to free my Assistant to watch the horizon with his M16. I was only able to get about 2-3 hours of sleep each night. My 6′ 3” body couldn’t rest in our vehicle packed with sand-bags and loads of gear. And, on top of that, I was also worried about being unarmed in combat. As soon as we arrived, all I could think about was sleep, but the area was still not secure. Even our Apache pilots had flown in 14 hours prior with no ground security at all – I can’t imagine how tired they were! Obviously, that wasn’t the plan, but our intelligence analysts hadn’t anticipated our Brigade Combat Teams meeting so much resistance on the routes ahead of us. I can’t ever remember needing sleep that badly. After we assessed the local threat as minimal and posted the first shift of guards on our perimeter, the rest of us could relax for the first time in 3 days. I was dirty and hungry, but I was safe. It was the most powerful sleep I have ever enjoyed, even knowing that the next day would present a whole new set of hardships and fears. All of us need a sense of security in order to rest. My wife, for example, sleeps much better when I am at home. Some people sleep facing the door to their rooms, especially when they’re alone. Children sometimes sleep with “woobies” and “teddies” because those things help them feel loved. No padlock, however, can keep out all prowlers. And no guard can protect us from our own guilt. We need security in Christ. Psalm 121:1-3 and Psalm 127:1-2 call us to trust God to do what only He can do. Only then will we find the confidence and energy to do what He has called us to do. Guards can fall asleep on duty, and a simple class 3 fluid leak can deadline a multi-million dollar weapons system. Look back at Jesus’ work! He died to secure our status before the Father and proved His trustworthiness by His life and resurrection! We can rest knowing He is our Savior and King, day or night. And there is one rest for which believers are still to look forward. Jesus is coming back to for us. The One who died to save our souls is coming back to perfect us, body and soul, so we can live with Him in Paradise forever. (Isaiah 65:17-25, Hebrews 4:6-12, 2 Peter 3:8-16) Again, God created us body and soul. And He will save us completely, body and soul. 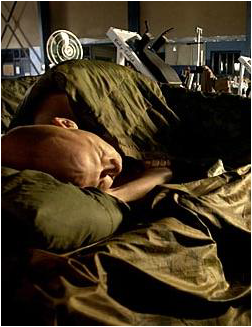 This entry was posted in Workout Wednesdays and tagged devotional, rest, W.A.I.T. training devotional. Bookmark the permalink.